Day 9: Goodbye Poland, Hello Hungary! We started our day today in Zakopane with a long day of transit ahead. The weather had taken a turn for the better; after a few days of growingly uncomfortable heat, we had a thunderstorm followed by a cool, crisp day that made a Summer’s day abroad feel a bit more like an Autumn day back home. We would bid the quaint mountainous town of Zakopane a premature farewell as we boarded the buses to Budapest. The mountains were misty as we headed off towards the Polish-Slovakian border. We had to stop at a gas station on the way out because of the “go-boxes” which we had to wait for. This is one of the bits of European bureaucracy that we had to face during this trip overseas. My main reminder from this stop, which ended up taking longer than was originally presumed, was just how much time and effort the GTCYS administrative staff and our tour guides and bus drivers have put into this tour for our benefit, comfort, and enjoyment. I thought it would be appropriate to talk about our tour guides on my blog since this is a day with fairly heavy transit. We have two tour guides who are both native Germans, one to each bus. Gabby was the tour guide for the first bus, and the second bus (which is the one I ride in) has Winfried. I can’t begin to explain how much these individuals add to our tour experience, but I’ll try anyway. I unfortunately haven’t gotten the chance to meet or hear Gabby extensively, but I can speak to Winfried who has been narrating my tour for the past week. Winfried is able to speak with a greater amount of directness and poise than one would even expect from most native English speakers. He is charming, witty, and friendly while giving us cultural, historical, and political knowledge of the places we visit. 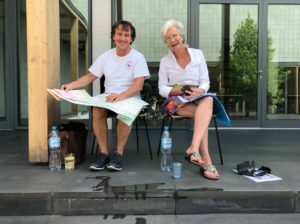 He is also able to give pertinent information that has greatly changed my tour experience for the better as when we were in transit to Auschwitz-Birkenau, which is a place that I personally had only general knowledge of. Not only do they provide the important cultural information, but also practical information specific of these places so we can all stay safe and smart. They enrich our experiences beyond measure. Moving on, we had gotten the “go-box” situation sorted and headed onward. We passed into Slovakia where we stopped for lunch before heading into Hungary and the metropolis of Budapest where we checked into our hotels. 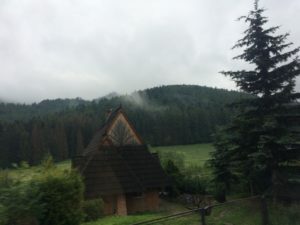 This entire ride from Zakopane to Budapest had marvelous scenery. There were rolling plained hills, dense forests up mountains, and the most picturesque little Eastern European towns. As we left the immense nature of the Carpathian mountain region and headed towards the sprawling metropolis of Budapest, Maestro Smith talked to us about some of the cultural knowledge that he enjoyed about Hungary as we were approaching Budapest: four Hungarian composers we should all know (Béla Bartók, Zoltán Kodály, Franz Liszt, and György Ligeti). The main event of the day was a cruise on the Danube river. We drove down to the dock and boarded the boat where we were greeted with complimentary drinks by the boat’s staff. We all sat down and started eating dinner as night began to fall over the river. 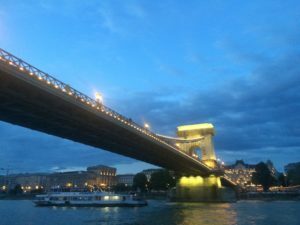 It was a wonderful occasion; all the students walked around the boat for a few hours as it cruised around the Danube, with its views of major landmarks in Budapest. The wind was crisp around the outside parts of the boat where kids gathered around, taking photos, joking, and having an all around good time. The lights of the city shimmered as we cruised by. I couldn’t help but feel evocation of our contemporary piece, Liquify by Michael Abels (who is one of our chaperones, and a wonderfully insightful and delightful person), as we were on the water. As the boat moved its way back to the small dock where it started, Johann Strauss II’s Blue Danube Waltz played over the boat’s speakers. 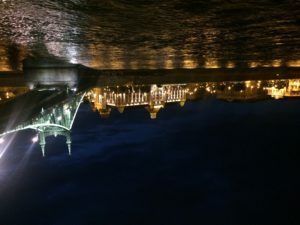 Words cannot describe the majesty of Budapest from the waterfront at night and the awe one feels when looking at it all. I can’t state in enough depth about how fortunate I feel to be on this tour and how glad I am to be able share it with all of my GTCYS peers, some of whom have become close friends over the past year playing together.